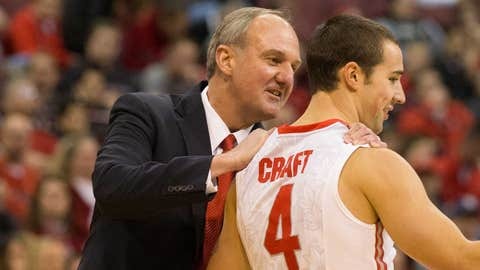 Nov 29, 2013; Columbus, OH, USA; Ohio State Buckeyes head coach Thad Matta congratulates guard Aaron Craft (4) for his play against the North Florida Ospreys at the Schottenstein Center. Ohio State won the game 99-64. The longest losing streak of his career isn’t sitting well with Ohio State’s Aaron Craft, though the senior might not have to endure it much longer. A date with struggling Nebraska could be just what the 11th-ranked Buckeyes need as they try to avoid their first four-game skid in six years Monday night in Lincoln. It seems nearly everything has gone wrong for the Buckeyes (15-3, 2-3 Big Ten) during their worst slide since February 2009 – two seasons before Craft joined the program. "We can stay here and feel sorry for ourselves, and that’s the easy thing to do," said Craft, who has a combined 22 points with 15 turnovers during the skid. "Nebraska’s not going to feel bad for us." Ohio State moved up to third in the rankings after improving to 15-0 with an 84-53 win over visiting Nebraska on Jan. 4. Since then, the Buckeyes lost 72-68 in overtime at then-No. 5 Michigan State on Jan. 7 before an 84-74 home loss to then-No. 20 Iowa on Jan. 12. We can stay here and feel sorry for ourselves, and that’s the easy thing to do. Nebraska’s not going to feel bad for us. On Thursday, they were outrebounded 39-24 and outscored by 18 in the paint in a 63-53 setback at Minnesota. "(Coach Thad Matta) just told us, ‘Right now we’re at rock bottom,’" said leading scorer LaQuinton Ross, who has totaled 44 points over his last two games. "We can’t get no lower than this." The Buckeyes posted their second-lowest point total and a season-worst field goal percentage (35.3) against the Gophers. They haven’t been able to take care of the basketball, averaging 17.0 turnovers during the slide. Ohio State also has allowed 73.0 points per game and a 47.9 field-goal percentage in its last three after limiting teams to 54.9 points on 36.9 percent over its first 15. The Buckeyes, though, appear to have a good chance to avoid dropping four straight for the first time since the 2007-08 season. The Cornhuskers (8-8, 0-4) are coming off their fifth straight defeat, 70-64 at Purdue on Jan. 12. They’ve struggled at both ends, averaging 60.6 points on 38.8 percent shooting while allowing 73.2 per game and a 49.8 field-goal percentage during the losing streak. "A lot of the guys came from being king whoever, wherever they were, and you’re not king anymore – not in this league," coach Tim Miles said. "You’re not even a prince, we’re just the jesters trying to work it out." Ohio State has won six straight meetings by an average of 25.0 points since Nebraska joined the conference in 2011-12. Amedeo Della Valle led the way with 15 points, while Shannon Scott and Marc Loving added 13 as the Buckeyes blew the first meeting open with a 44-23 second half. Terran Petteway, averaging a team-high 17.3 points, scored 15 on 5-of-12 shooting for the Cornhuskers. This will be the first meeting at the new Pinnacle Bank Arena, where Nebraska has won seven of eight – with its only loss coming in a 71-70 defeat versus Michigan on Jan. 9. Lenzelle Smith Jr. hit all six of his shots on the way to a game-high 21 points and Craft added 14 in Ohio State’s 63-56 win in the most recent contest in Lincoln on Feb. 2. Nebraska has dropped 15 straight against ranked opponents by an average of 20.6 points, including double-digit losses to then-No. 22 Iowa and Ohio State this season. The Buckeyes have won 10 of 12 all-time meetings and the last nine in a row.